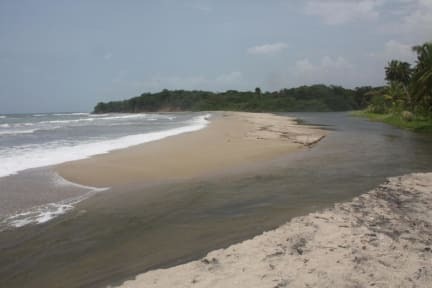 Coco Sänkala Hostel offers accommodation with private rooms and shared dorms in Palomino, Guajira - Colombia. 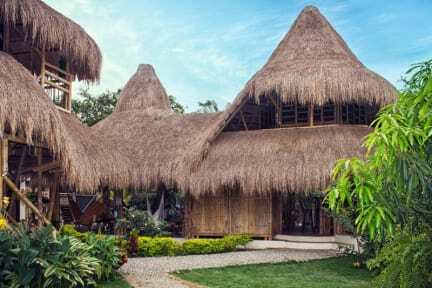 The Architecture and Design of the hostel is entirely made with Bamboo being eco friendly and maintaining the harmony of the surrounding nature. The hostel has a chill out communal area with free Wifi, hammocks, small library,T.V and garden with views to the snow covered mountains of Sierra Nevada. In addition, guests have a shared kitchen, which is fully equipped for cooking. At the hostel, guests can ask for laundry service and touristic places in the surrounding area.The total capacity of the hostel is 20 people which make it a little quiet and peaceful hostel. Coco Sänkala Hostel is located in the heart of Palomino between the beach and the village. The hostel is 10 minutes’ walk from the beach. Coco Sankala Hostel is situated in the middle of the main Street to the beach (Via al mar), at 6 blocks from the main road in direction to the beach then one the left side 100 meters. We are next to Bikini Hostel and Bella Flor Hostel. The nearest airports are Simón Bolívar International Airport of Santa Marta (75km) and Riohacha airport (70km) from the property. The private rooms have a double bed with mosquitoes net, a fan and private bathroom. Each private room has a hammock outdoor. We have one special private room with a balcony with view to the Sierra Nevada. We have two types of dorms: the 8-bed dorm and the 4-bed dorm, each one with private bathroom, mosquitoes net, fans and lockers. Check in from 13:00 to 22:00.